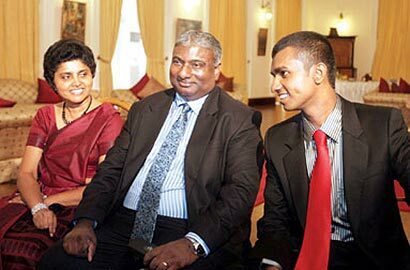 Shaveen Bandaranayake, son of former Chief Justice Shirani Bandaranayake questioned MP Namal Rajapaksa’s statement over summons issued on her mother by the FCID, drawing parallels with the way the former government treated his mother. Bandaranayake, posting a comment on the Parliamentarian’s status update on Facebook, asked Rajapaksa if he understood how he (Shaveen) ‘felt when my family was condemned, vilified and harassed during the past two and a half years’. Shaveen Bandaranayake also asked how he would have felt when his parents were summoned to the Bribery Commission. The former Chief Justice was ousted by the former governor through a hurried impeachment process that came under criticism from many circles including the legal fraternity of the country. The comment posted by Shaveen Bandaranayake is as follows: “Mr. Rajapaksa, you tend to forget those who you’ve left in your wake. My mother, father, aunt, uncle nor I were politicians. Yet, your government moved swiftly to condemn, vilify and harass us throughout the past 2 1/2 years. How must I have felt when my parents were called before the Bribery Commission? How must I have felt seeing them being carted day after day to courts? How must I have felt seeing them being defamed by the government media that you so eloquently manipulated during your rule? Before you seek sympathy or support, ‘audi alteram partem’. You are an attorney, look that up”. When I am called to courts it is called ‘eloquently manipulated’, but when you are called to the courts then it is not ‘eloquently manipulated’.